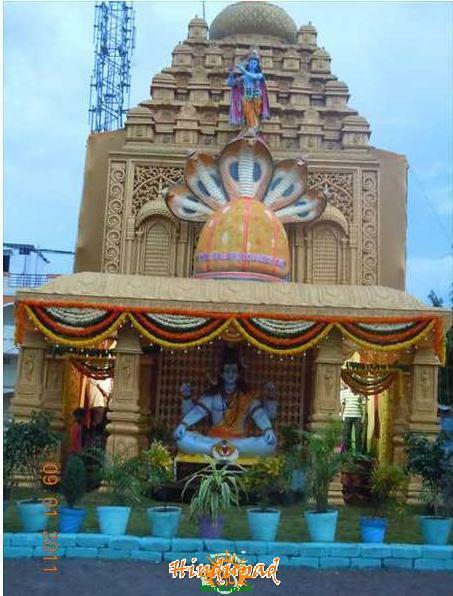 Balapur Ganesh Mandal, one of the popular Ganesh pandals in Hyderabad, is located at Balapur village in Greater Hyderabad limits. 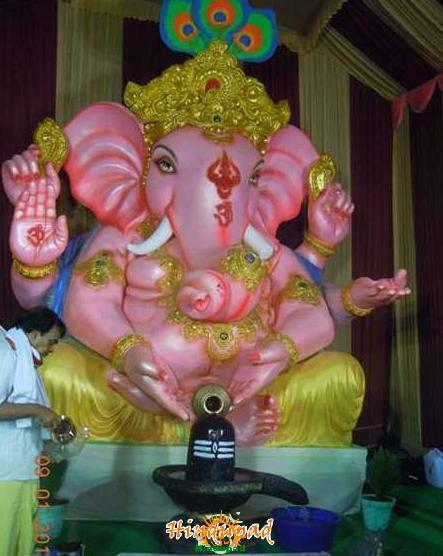 It was first established in 1980 and was the first ganesh pandal to introduce Ganesh laddu auction in the world. For 2011 Ganesh Chaturthi, the mandapam is decorated with a setting of Dwarka Sri Krishna Temple (Dwarkadhish Temple) of Gujarat with a setting of the temple, Krishna idol on Kaliya, and a huge idol of Lord Shiva at the entrance. And the Ganapathi idol is also designed as it performing Abhishekam to Shivalingam. Balapur Ganesh mandal has made it to limelight nationwide when they have started laddu auction in 1994. That year, the laddu was auctioned for Rs 450. Since then the price of laddu auction has been increasing substantially. In 2010, Balapur laddu auction price was Rs 5,35,000. A part of laddu is distributed among devotees, and the remaining laddu is sprinkled in fields (farms) of the devotee who gets the laddu in auction for better crop. All the devotees who had won the laddu in auction were benefitted hugely, hence it has become more and more popular. Read about Balapur Ganesh more at the official website of Balapur Ganesh Utsava Samithi, Hyderabad. the balapur ganesh events are inspirable to all ages of people and those events are memorised all sprituval affections and am proud and pride balapur ganesh association thank you.